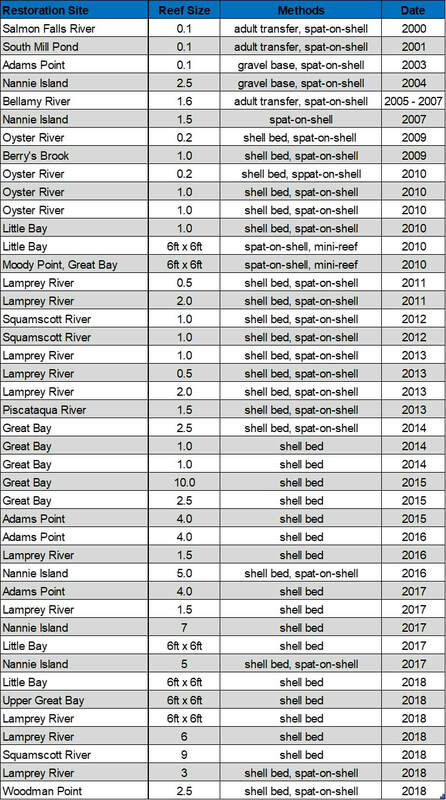 Since 2000, we have constructed seventeen oyster restoration projects in the Piscataqua River and Great Bay estuarine system. Most of the projects involved remote setting of larvae from a disease-resistant/fast-growth strain of oyster, but differed in other ways related to reef size and spat density or arrangement of the individual reefs within the overall project area. The table below provides an overview of the characteristics and history of each site. Remote setting is a technique used to produce oyster spat (young oysters) from oyster larvae. 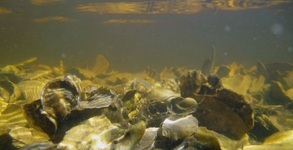 Adult oysters are spawned at a hatchery where they produce millions of tiny oyster larvae. We typically obtain our larvae from Muscongus Bay Aquaculture, a hatchery in Bremen, Maine, where the spawning occurs. The resulting larvae are picked up from the hatchery, brought back to UNH's Jackson Estuarine Laboratory (JEL), and placed in large tanks where they will “set” or attach to recycled oyster shell that has been placed in trays and submerged in seawater. This process results in spat-on-shell that are moved to a “nursery raft” in the cove just offshore of JEL. They remain here for about two to three months. After reaching about one inch in size, the spat-on-shell are put into the estuary at a restoration site.